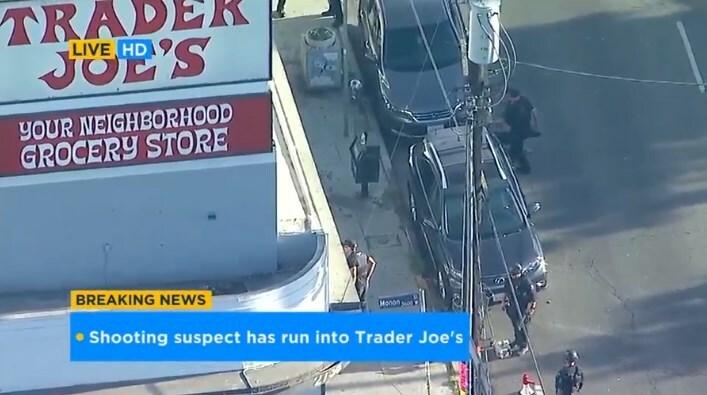 SILVER LAKE, LOS ANGELES (KABC) -- A woman is confirmed dead following a barricade situation involving a shooting and chase suspect who held hostages inside a Trader Joe's in Silver Lake on Saturday. Los Angeles Mayor Eric Garcetti and LAPD Chief Michel Moore said at an afternoon press conference the woman killed was fatally shot in the crossfire between the suspect and police and was pronounced dead at the scene. Los Angeles police said the incident started with a family dispute in the 1600 block of 32nd Street in South Los Angeles, where the suspect shot his grandmother and another female victim, police said. A pursuit then ensued until the suspect crashed outside the supermarket, and an officer-involved shooting occurred. Police said that at one point during the incident, the suspect fired at officers and then fired at the woman who later died from her injuries. The suspect ran into the Trader Joe's, located in the 2700 block of Hyperion Avenue, where several SWAT officers and an armored vehicle surrounded the building. A family reunification location for family members affected by the barricade situation is at LAPD Northeast Station, located at 3353 N. San Fernando Road. You can also call 323-561-3211. The public is urged to avoid the area of Hyperion Avenue and Griffith Park Boulevard. 0 Response to "Silver Lake Trader Joe's barricade: 1 dead, suspect in custody"